Newcastle ferry port has regular sailings to Amsterdam (IJmuiden) in Holland. Newcastle is a bustling city in the North-East of England, situated on the banks of the River Tyne. Small enough to walk across in 15 minutes, Newcastle nevertheless packs in everything you would expect from a major European city: culture, heritage, shopping, nightlife and even greenery in the shape of the Town Moor, an area bigger than Central Park in New York. In the space of half a mile there are 7 bridges across the Tyne, all visible from the famous Quayside. The Tyne Bridge is an international icon and the inspiration for Australia’s Sydney Harbour Bridge, built soon after. For centuries Newcastle was famed for its innovation - from here, the first steam locomotive gave birth to the industrial revolution and the coal-mining industry that powered it. The electric light bulb was developed here and the first street in the world lit by an incandescent lightbulb was Mosely Street in Newcastle. Other Newcastle inventions include Lucozade Engery Drink and Wispa Chocolate Bars, but Newcastle's innovation is not just consigned to the history books; one recent example being eminent Newcastle orthopaedic surgeons creating a pelvis using 3D printing technology. For history buffs, nearby Hadrian's Wall is a great place to visit and walk. The Roman fort Pons Aelius was built in Newcastle about 120AD, around the same time as Hadrian’s Wall. The first ‘New Castle’ from which the city gets it's name, was a wooden motte and bailey castle built by Robert Curthose in 1080AD, to prevent raids by the Scots. The stone castle was built between 1168 and 1178 on the orders of King Henry II, with further additions being made in the reign of King John (1207-1216). The regional nickname for people from Newcastle and the surrounding area is "Geordie", and the local dialect of the same name, while sometimes difficult for visitors to understand, adds a warmth and charm unique to the area. Today, a regular ferry service runs to Amsterdam in the Netherlands, perfect for short city breaks or longer holidays in Europe. From the North: Head for the Tyne Tunnel via the A19, follow the directions as above. Newcastle Central Station is about 20 minutes by bus from the port. A special DFDS bus leaves from Newcastle Bewick Street (opposite Central Station) before each sailing and takes you to the International Ferry Terminal (and back). 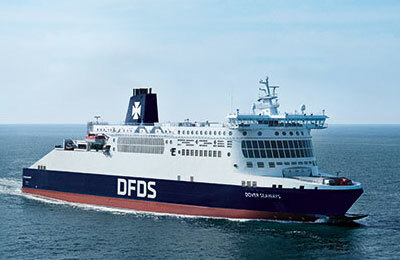 There are two DFDS bus departures for each sailing; the first one leaves at 14:45 and the second leaves at 15:45, 1 hour 15 minutes before departure. Book in advance or pay the driver when you board.